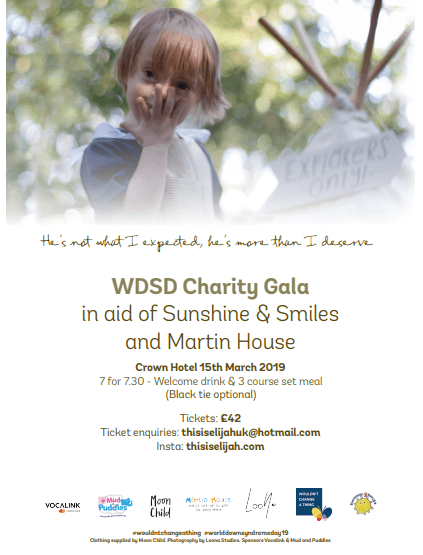 To celebrate World Down Syndrome Day 2019, I will be holding my 4th Charity Gala in aid of Martin House Hospice and Sunshine and Smiles – two local charities very close to my heart. Martin House has been providing family-led care and support for children and young people with life-limiting conditions for more than 30 years. Every year they support over 420 children and young people, and their families plus 150 bereaved families across West, North and East Yorkshire. Sunshine and Smiles is a support group for parents of children with Down Syndrome. If you watched Sally Philips documentary ‘A World Without Down’s’ on BBC2, you will know why these charities are so important. NIPT has been given the go ahead in some counties, termination is legal in the UK up to 40 weeks and the termination rate for a prenatal diagnosis was already at 92%, with these tests we face the very real chance of a ‘World Without Down’s’. How different my life would be if these tests had been available a few years ago. My son was born in 2013, he has Down Syndrome. He is my teacher, my inspiration, and my guiding star, without him I would cease to exist. With Sunshine and Smiles I educate medical students and professionals on what life is really like with a child with Down Syndrome and how to deliver a diagnosis. It is not doom and gloom. It is the most joyful journey I have ever taken. The CEO of FinancialForce (where I work) is purchasing a table from his own pocket AND is flying over from San Fran for the event, he is so supportive of everything I do after meeting Elijah a couple of years ago. Tod has worked closely with the likes of Bill Gates and is still the most grounded and generous person I have met, despite his connections, title and work load! Vocalink (Mastercard) are yet again sponsoring the event and have donated an Amazon Echo plus smart plug! Other prizes include a NutriBullet donated by High Street TV, Five prints from the amazing Oliver Hellowell (photographer with DS – he’s on the One Show this Thursday!!! ), Bed & Breakfast for 2 at The Crowne Plaza, a football signed by the Manchester United Squad! £100 team lunch from LeanLunchUK, £199 Signature Service from GTService, £75 Voucher for Gianni’s Brio, and a wee cook book signed by Gino D’Acampo and oodles more!! Tickets include welcome drink and 3 course meal and are £42 per head.